My approach to lighting a show is to watch it, and let it tell me what it needs to look like. In this case I had to watch a much earlier run-through than I’d have preferred, because we had to reserve lighting equipment and create budgets. I drew a heat map of the action for each act, and then I set those aside. I re-read the play and made a few more notes. I drew two instruments on a plot and set that aside. I had lighter’s block. The problem was twofold: as well as I knew the play, this production wasn’t speaking to me yet. I was also unsure about how to design a plot that could be quickly adapted to all four spaces. My solution (which came as the vice continued to close) was to make a palette. I listed the conceptual elements I thought I’d need to paint the overall picture, and didn’t bother with a traditional plot, tied to a specific inventory and stage layout. On Saturday I brought the palette to the Palace Theater, and was suprised at how quickly I was able to “fill in the blanks.” Instead of moving lights to where I might have placed them on a traditional plot, I took what was there and fit it into my palette. Last night I was able to see roughly how well it worked, as I watched a rehearsal that was much advanced from what I’d seen weeks ago. Now the piece was beginning to speak to me, and I was able to see very clearly what was working and what needed modification. I have one more night in Hamilton before we strike and setup the premiere at SUNY Albany next Friday. The block is gone, but there’s a lot of work ahead. 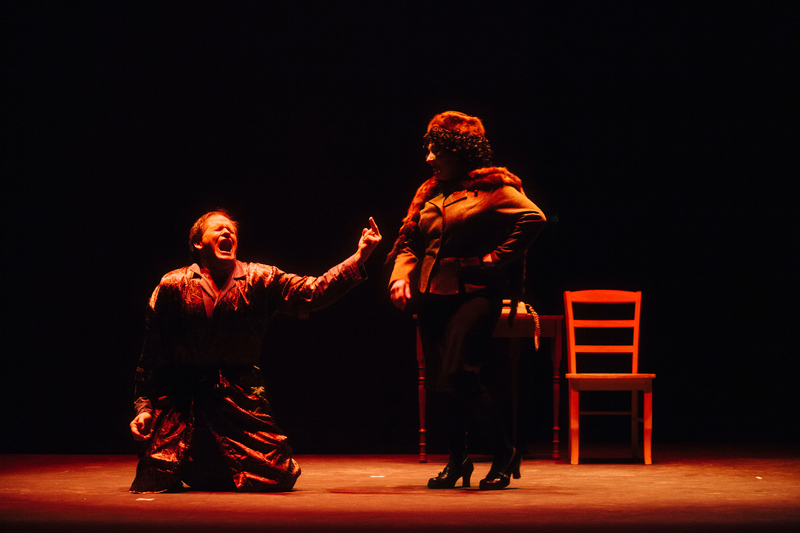 In the mid-1990’s I was still providing lighting for Players of Utica’s annual Scrooge at the Stanley Theater (they’ve used my design sans credit since then.) Somebody came up with the idea to also present at Rome’s Capitol Theatre. That was my first traveling show. A traveling show needs to be pared down to a common denominator – the lighting and sound must fit many places; they need to be set up in a reasonable amount of time, without much opportunity for revision. Broadway tours have pre-configured trusses that can be hung and plugged in; smaller budgets rely on what’s available at each venue. 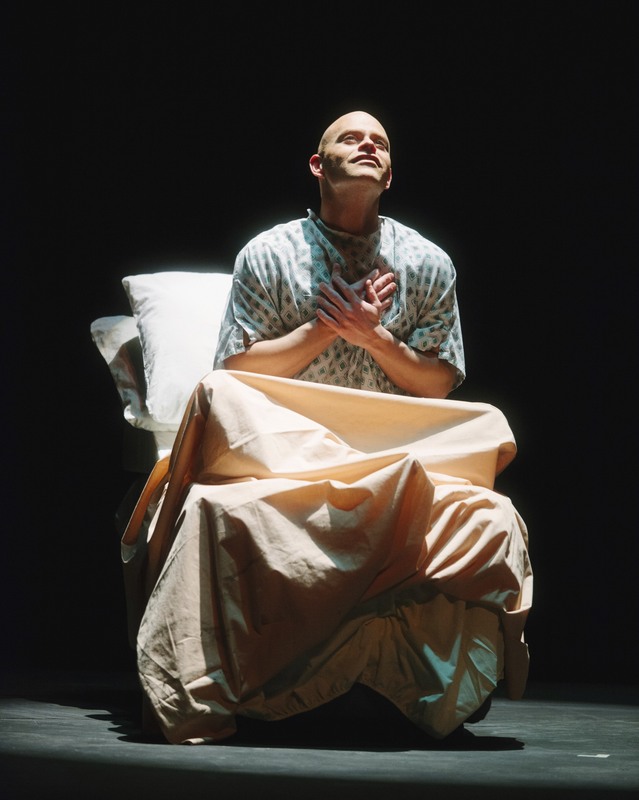 Angels in America was conceived as a traveling show, but the four venues couldn’t be more different. Hamilton’s Palace Theater has 30 dimmers, 39 lights and a 2-scene controller; overhead pipes fixed at 15′. SUNY Albany’s Main Stage has a pre-hung house plot (huge) and an ETC Element controller (which I’d never used.) Utica’s Stanley is a strange mix of house plot (FOH) and bare stage, but it’s the space I’m most familiar with. (The Stanley’s ETC Express 125 turns out to be MUCH different from a programming perspective than the ETC Element. Damn ETC.) Syracuse University’s Hendricks Chapel is… a church. To save time I opted to focus lights myself. Although we’d had a tech in Hamilton I hadn’t seen my full plot and I wasn’t entirely sure how things needed to look. SUNY Albany uses an A-frame ladder to reach the lights, because the administrator in charge of the program thinks those are safer than Genie lifts. Ha. I hadn’t been up an A-frame in fifteen years. It’s an interesting process. You climb up the slanted “A” part, and from the apex a straight extension goes up. You release the lock and push the extension to the height you think you’ll need to reach the lights, hanging at 23′. Then you climb the extension and throw your leg over, so you’re sitting on the top rung. Thing is, when you’re going up your weight pulls the ladder one way. When you throw your leg over, the center of balance shifts. In the case of Albany’s ladder, the hardware was a bit loose. The shift ended up rocking the extension 3′ in the air – vertiginous indeed. Once you are seated, two people push the ladder around the stage (it’s on wheels.) I’d never worked at SUNY Albany before, but I learned the stage is not quite flat. As we rolled around I swayed through the air, 23′ above the stage. It took longer than I’d intended to focus all of the lights. I believe in hard stops. I’d set a limit of 9:00 pm whether or not we’d finished, and everyone was looking forward to going home or out to dinner. I finished my focus at 8:00 and then began the task of learning a new computer lighting board; I had 117 cues to write before tech rehearsal the next morning. By 9:00 I’d finished 24. I give the SUNY Albany crew a lot of credit – they were as accommodating as can be. They arrived early and cheerful so I could finish cues. We ran our tech rehearsal on Saturday morning, surprisingly smooth (it was the first time I’d run sound and lights together on the show.) Our Saturday evening premiere went well. For eight people. (Or twelve, depending on whom you ask.) Not enough to pay hotel bills. We had a perfect storm working against us: school break, nearest parking lot to the theater a quarter mile away, and RAIN. I wheeled my stuff back to the car in a downpour. I drove home in a downpour. Arrived 1:30 AM, miserable and starting a cold. Four days later. Next was setting up the Palace again – they’d struck my previous work for another show. I thought we’d set up and do a quick check before leaving; turns out, the director intended a full run (also news to some of the actors.) It was the first time I told a director I hated his guts (sort of kidding.) I had a box of tissues and cough drops and felt like crap. Still, I set a new PR: everything ready to go in 100 minutes. Running a 2-scene lighting board requires concentration and imagination. You create every look on the fly, while the previous scene is playing. It gets harder when you’re also running sound cues. Wednesday and Thursday’s runs weren’t perfect, but they burned the show in my mind. I imagine many lighting designers have a space they work in more than anyplace else – comfortable, positions and angles familiar. For me it’s the Stanley Theater, a 3000-seat movie palace with a flat-angle front hanging pipe that casts terrible shadows on almost any backdrop. It’s where I learned my craft. I supervised the design of new box booms about 16 years ago, which are still in use but take a while to hang and focus. Once I flew a front lighting truss 40′ over the audience using scaffold hanging points above the ceiling, for a whiny American orchestra that didn’t want light in their eyes; I didn’t relax until the rig was finally loaded out. The Stanley is rarely ideal, but it’s home. Years ago, local shows played the Stanley all the time. I lit dance recitals and barbershop quartet concerts in between bus and truck shows, back when prehung box trusses were less common. A stagehouse expansion bumped prices beyond the reach of smaller productions, which were forced down to the high schools and colleges. The problem is not just theater rental (4 figures); add in lighting and sound rental (another 4) and union labor to set it up (4 more figures). A 2-day rental can run well over $5,000 – many times the budget of a small show. Still, in December 2013 I gave Alex Trinca a brief tour of the Stanley – he was hooked; he booked. “The show is performed almost entirely US of the proscenium, except one scene where the actors sit DSC, legs dangling off the stage. The playing area is approximately 25′ w, 16′ deep. “There should be a portal set of black legs and border, immediately US of the proscenium. These should be 12-1/2′ off center, 20′ high. Legs should be hung flat if possible, no fullness and hard edged. There should be a second set of black legs and border at mid-stage, approximately 8′ US of the first set. Same opening and height. The US limit will be a black traveler (16′ from the first leg set), open 6′ in the middle (3′ off center). A black backdrop will be 3′ US of the traveler. To save time at the Stanley, I left the legs and backdrops as I found them, which produced a much deeper stage than had been intended. I taped a playing area for the actors to stay within, then tied the legs back another two feet to maintain proportions. I only lit within the taped area, which produced an unintentional effect: as actors made their entrances and exits, they seemed to fade in and out, like the ballplayers in Field of Dreams. Normally at the Stanley, one avoids shadows on the backdrop by using the box booms for most front lighting; if the balcony rail is used, the beam is diffused with a frost gel to disguise the edge. I didn’t have time to hang box booms, so I knew I’d have shadows to deal with. Instead of blurring the edges, I used hard shutter cuts for every light, and angled them in strange ways – the light beams had become part of the scenery. As I work, there is an increasing panic as lights are hung. In the design phase, the page is blank – changes can be made. Once lights are hung, changes cost time and money. I second guess myself – is there enough coverage? Are the angles right? As the lights are focused (aimed), I’m less sure I’ll be able to pull it off. Hanging the Angels in America lighting plot at the Stanley took about three hours; focus was another ninety minutes. These may be personal records – they would not have been possible without Joe Fanelli, stagehand par excellence. I wrote cues on a bare stage through the afternoon. Angels ended up having 121 lighting cues and 68 sound cues. I was able to carry the sound cues with me on an iPad, but the computer lighting boards at SUNY Albany and the Stanley were not compatible. At a rate of one cue per minute, I finished in just over two hours. I didn’t know what the lighting really looked like until I saw it on actors the following day. I might have wept with relief – it worked. In many scenes it was beautiful. We ran a dress rehearsal in the morning and performed for the audience in the evening, a long day when the show is 3+ hours. We finished at Hendricks Chapel. I’ve tried to give my sense of the other venues we performed in; before I disparage Syracuse University I’ll say that I appreciate the Chapel’s mission and the pastoral staff I met. At the same time, it was a rotten experience from my perspective as a theater technician. Alex met Tony Kushner last year when Kushner spoke there. 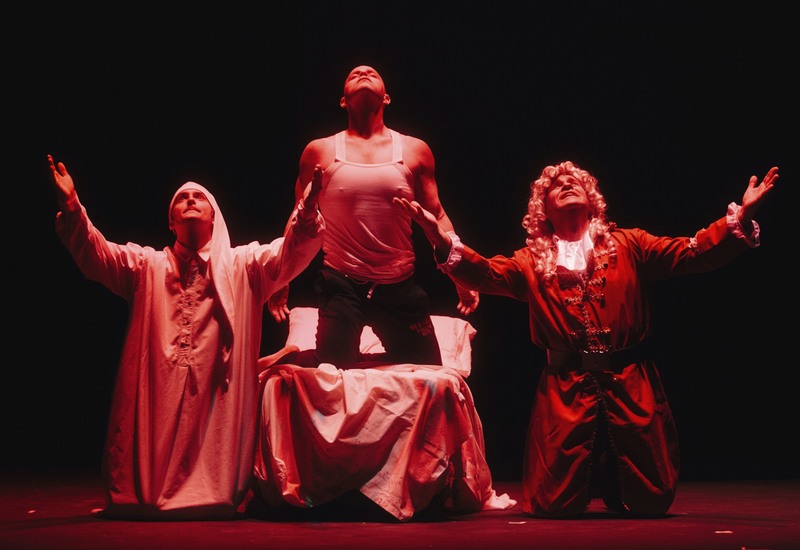 The playwright was skeptical about performing Angels in a church (because it is not a theatrical space). I could have found the equipment and set it up, but it would have meant a LOT of work (borrowing lights, transporting them, loading in, setting up – we couldn’t start until 7:30 Friday night), no guarantee there was power to run it all, and no pay. I made a cynical/weary decision: since the audience wouldn’t know the difference or the effort required, I’d use the preset church lighting. One wash, five seconds to blackout. I rented a small sound system, because the best answer I could get from University staff was, “You *should* be able to plug your iPad in…” Again, thanks to Joe Fanelli for a reasonable price and for being so damn helpful. Unfortunately, Alex diffused the situation. I had to stay. We’d borrowed a black backdrop from Munson-Williams-Proctor Arts Institute, which was erected on the stage between choir boxes. It had been up ten minutes when an actor pulled the entire thing over during an entrance. I used a broomstick and gaffer’s tape to secure the center pole to the altar. During our afternoon break I discovered to my dismay I’d left my wallet home. Borrowing money wasn’t the problem – buying alcohol at any of the nearby pubs was impossible. The day had turned from difficult to worse. I ran the show in full view of the audience, sitting stage left (and sober) in a choir box. The lighting controller limited where I could go, and I reasoned this fell within Kushner’s instruction to “let the wires show.” Of course, that meant I had to look like I was paying attention. Because I had less to do I was able to really watch the performers for the first time. They did well – there was some very good acting in this show. 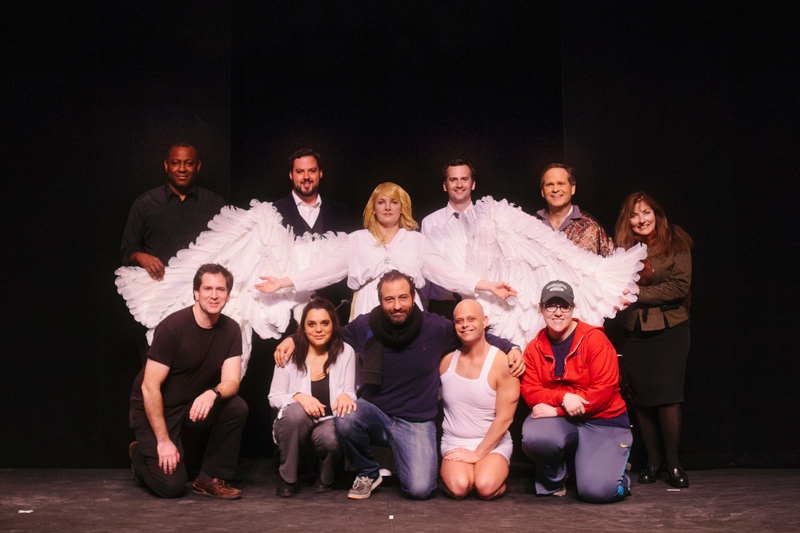 Curtain call: Alex, Liska, Laura, Linda, Barb, Patrick, Nick, Adam, Corey, Rick, William. In retrospect, this show was difficult enough without touring it. Why did we do it? Because it was hard. And because we could. Posted in Backstage, Memoirs. Bookmark the permalink.